Could prison save your life? The 62nd anniversary of the death of the Bharatiya Janata Party founder Shyama Prasad Mukherjee while in custody in Srinagar sparked discussion about the party’s alliance with the quasi-separatist Peoples Democratic Party. But a more interesting tangent for me is the still grim reality of custodial deaths in Indian prisons and police stations. A large majority of these deaths are a direct consequence of torture in custody. These deaths reflect only a fraction of the problem with torture and custodial deaths in India as not all the cases of deaths in police and prison custody are reported to the NHRC. Further, the NHRC does not have jurisdiction over the armed forces and the NHRC also does not record statistics of torture not resulting into death. This is certainly consistent with the image many of us have about policing in India being a brutal business. Even so it is also clear that some proportion of prisoners in custody would have died even if they had not gone to prison. The right way to think about the harm that prison does is to look for “excess mortality” i.e. whether being in prison caused people to die at a greater rate than they would have otherwise. According to the National Crime Records Bureau’s Prison Statistics India 2013, 1,597 of 411,992 prisoners died in 2013, which translates to a mortality rate of 388 per 100,000 prisoners. In the ten years between 2004 and 2013, the prison mortality rate ranged between 353 and 395, and averaged 377 (shown below). Underreporting. NGOs such as ACHR say that there is severe underreporting of prison mortality, and that the true figure is much higher. While this sounds intuitive, it’s much harder to hide deaths than it is, for instance, to hide rapes. You could cover up torture or mistreatment cases as having occurred due to natural causes (official figures say only 115 of 1,597 prisoners died unnatural deaths in 2013), but you can’t really pretend that a dead person didn’t die. Wrong measure. The mortality of the general population is perhaps not the appropriate baseline with which to evaluate prisoner mortality. The first thing to note is that only 4.4% of the prison population consists of women, which means we should focus on male mortality rates. 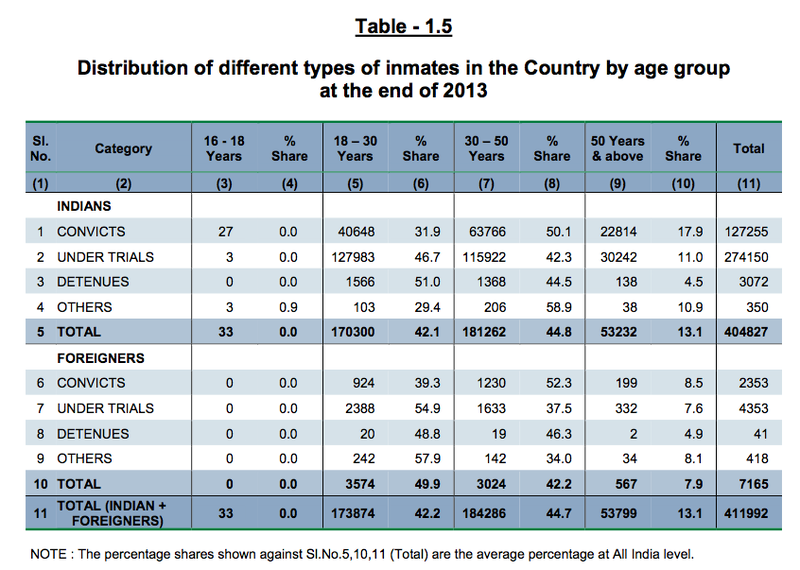 Second, the age distribution of the prison population is different from that of the general population, with a concentration of prisoners in the 18-50 age group (as Table 1.5 from the 2013 prisons report shows below), which is the more appropriate reference group. The mortality rate for the general male population (in 2011), weighted by the same age distribution as India’s prison population, turns out to be in the vicinity of 430 per 100,000, which is still higher than India’s prison mortality rate (keep in mind this is a back-of-the-envelope calculation). The number drops to 390 if we (somewhat arbitrarily) exclude all persons above the age of 65, but that’s still higher than the comparable prison mortality rate of 357 in 2011. Narrowing the sample yet further to men in the 20-50 age group, from whom 87% of the prison population is drawn, gives us 330, which at last produces a number lower than the mortality rate of the prison population. 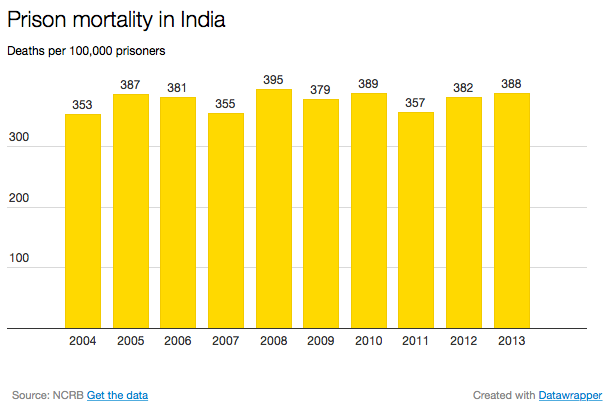 What this tells us is that India’s prison mortality rate is still surprisingly low. So what gives? It could be that the mortality-increasing effects of prisoner mistreatment are being swamped by the mortality-lowering effects of providing inmates with shelter, food, healthcare and physical security. Another way to think about this would be to compare India’s prison population’s characteristics with that of another country. A comparison with the United States is illustrative, since that country’s overall mortality rate is similar to India’s even though its crime and incarceration rates are much higher. The male mortality rate of the 15-54 age group (pdf) in the United States is about 420, higher than the 330 for Indian men in the broadly comparable 20-50 age group. Yet the prison mortality rate (pdf) in the United States averages 184 per 100,000, about half of India’s. It turns out that the gap between the mortality of the prison-going male population and of actual prisoners is much more favourable for prisoners in the United States than in India, which means there could still be something producing excess mortality in Indian prisons.